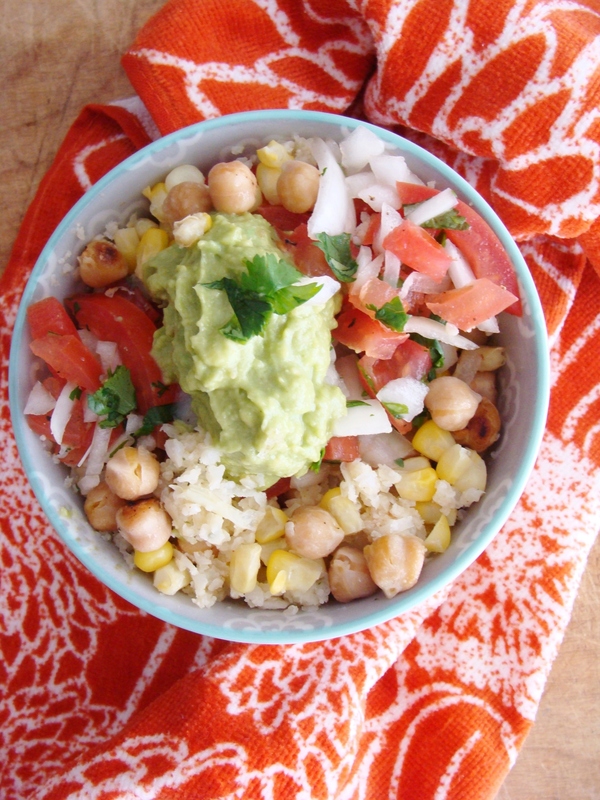 I’m talking about cauliflower rice burrito bowls! Cauliflower is kind of underrated, in my opinion. 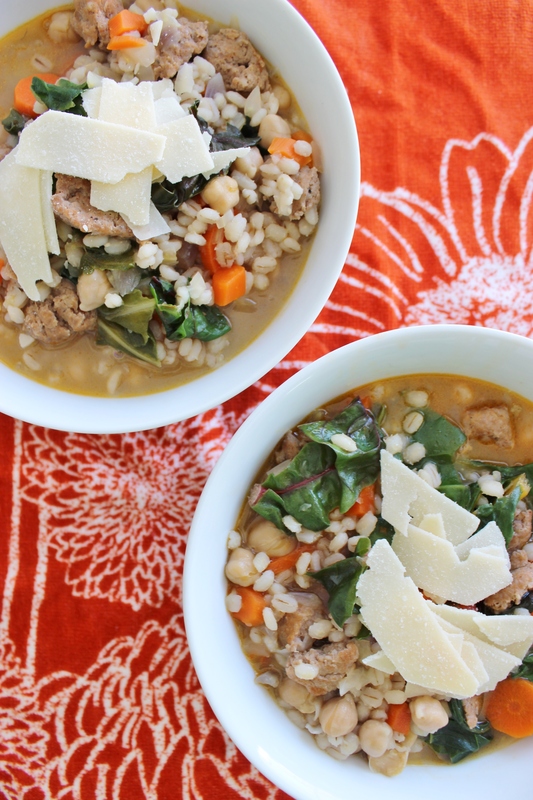 Because it doesn’t have a strong taste on its own, it’s perfect for using in a dish like this. Now, I don’t want to pretend that cauliflower “rice” tastes like actual rice. It doesn’t. It tastes like cauliflower. 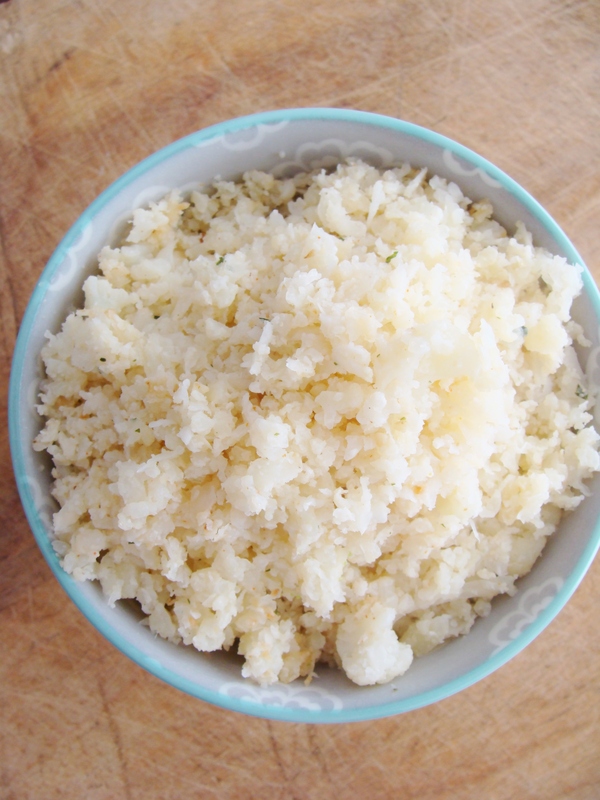 But on those occasions when you want to go heavy on the veggies, and lighter on carbs, this cauliflower rice works perfectly. 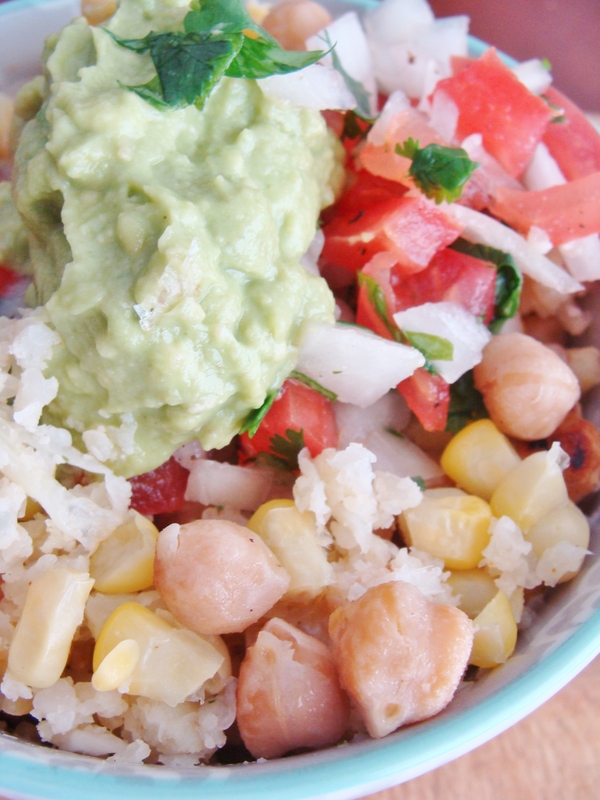 Optional toppings, such as fresh cilantro, cheese, sour cream, etc. I made my guacamole and pico de gallo first, then let both chill in the fridge while I cooked my cauliflower rice. To make your guacamole, halve and pit your avocados. Scoop the flesh into a small bowl and mash well, with a fork or potato masher. Add your seasoning, per your preference. I sometimes use the McCormick Mild Guacamole packet. 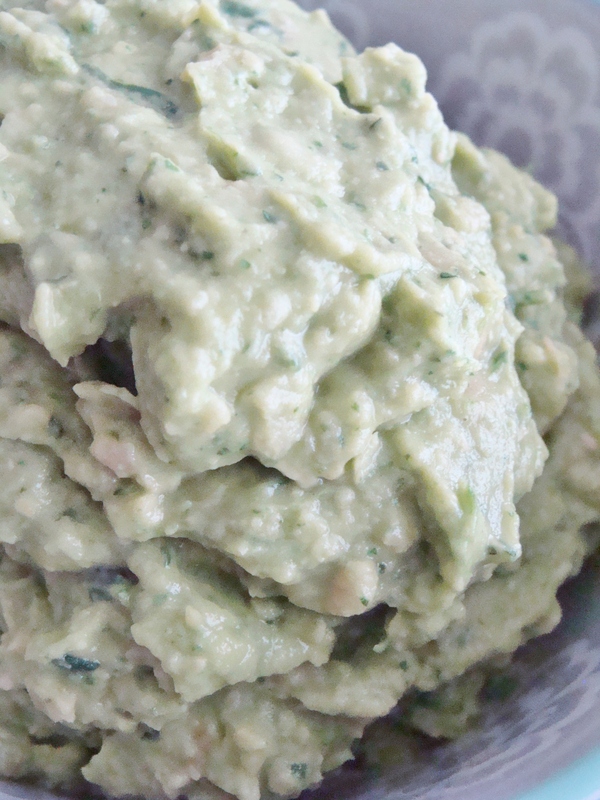 After you blend the avocado and seasoning well, add a tablespoon of fresh lime juice. To make your pico de gallo, begin by seeding and dicing the Roma tomatoes. Peel and dice the white onion. Put both the tomatoes and onion in a small bowl. Add the juice of 1 lime, plus 1 cup of fresh chopped cilantro. Blend well, then season to taste with sea salt and black pepper. 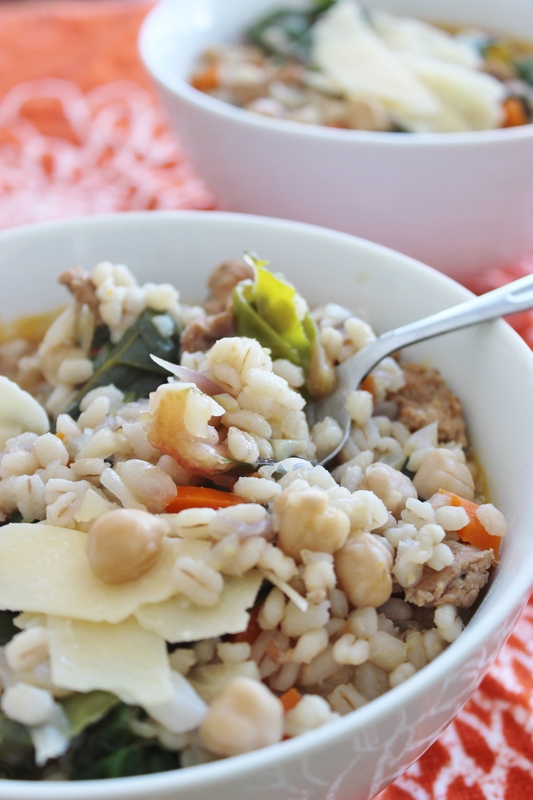 Now–to make our cauliflower rice! Rinse your head of cauliflower. 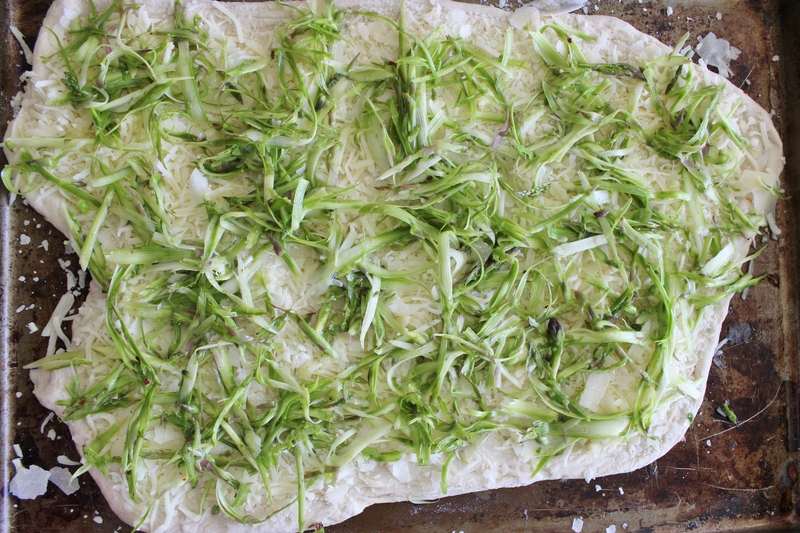 Remove the greens and stem. 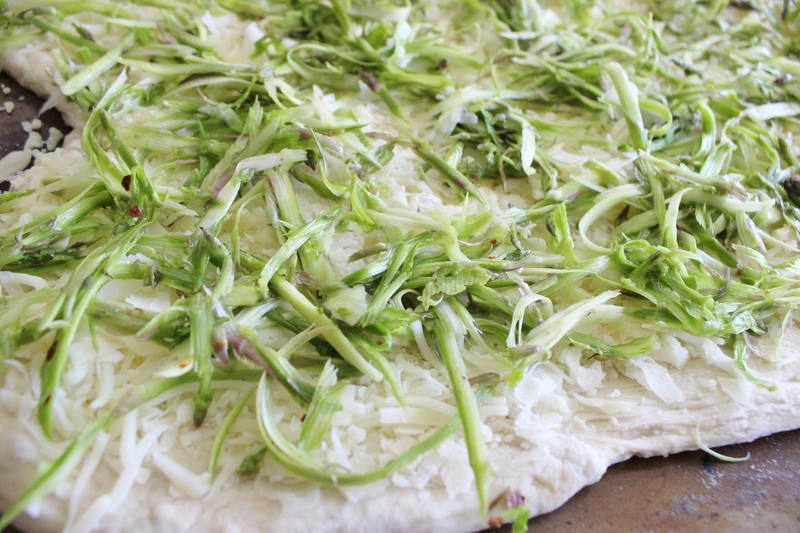 Grate the florets, either in a food processor or by hand. 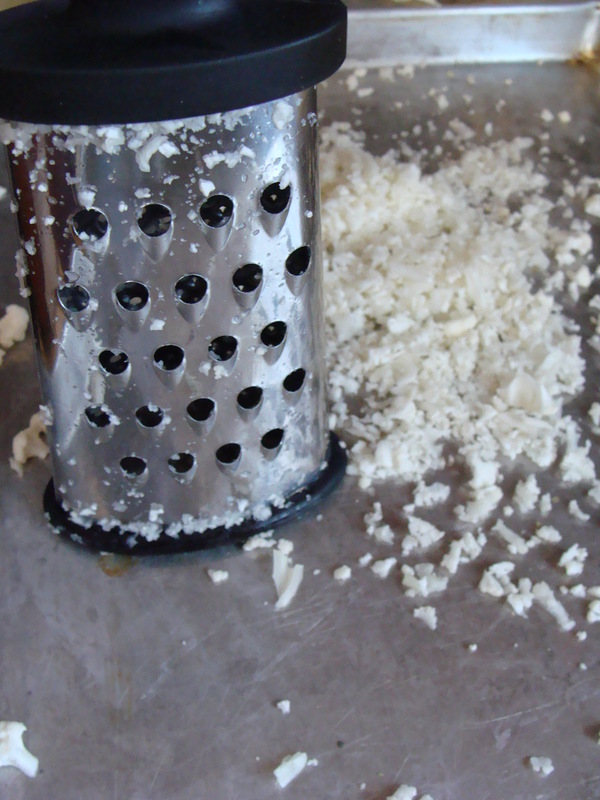 I only have a small cheese grater, so that’s what I used! I suggest grating the cauliflower over a cookie sheet to catch the small pieces. Once the cauliflower is grated, heat a large skillet over medium high heat and add two tablespoons olive oil. Once the skillet is warm, add your grated cauliflower, the juice of one lime, and your seasonings. 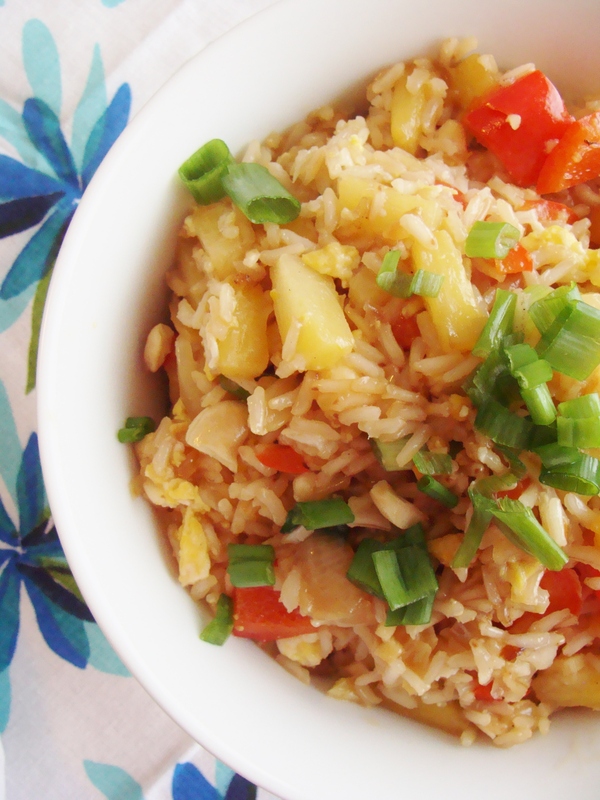 Cook the rice over medium high heat for 15-20 minutes, stirring frequently. Cook until the cauliflower becomes soft and browned. Taste, and add more sea salt and pepper as needed. Now, it’s time to prep the rest of the ingredients for our bowls! 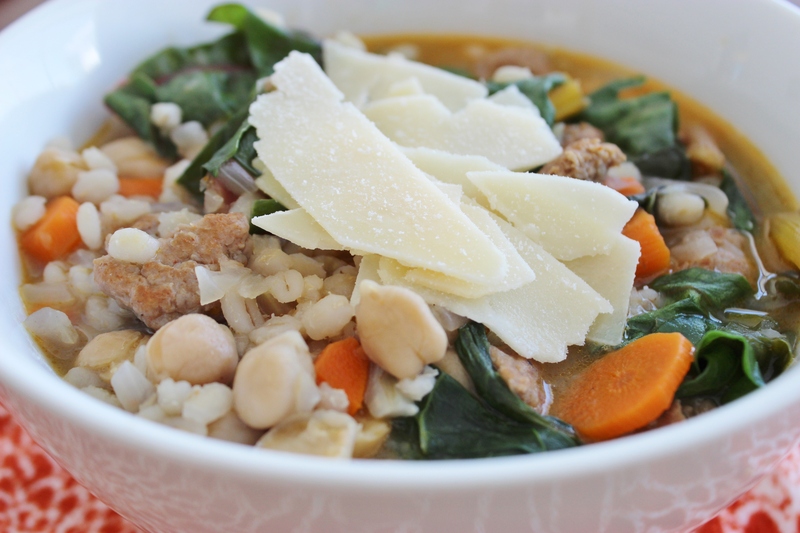 Rinse and drain your can of garbanzo beans, and warm the beans over medium heat in a small saucepan or skillet. I like to saute the beans until they begin to crisp and brown. Also heat your corn, either in a small saucepan or in the microwave. All that’s left now is to mix it all together! 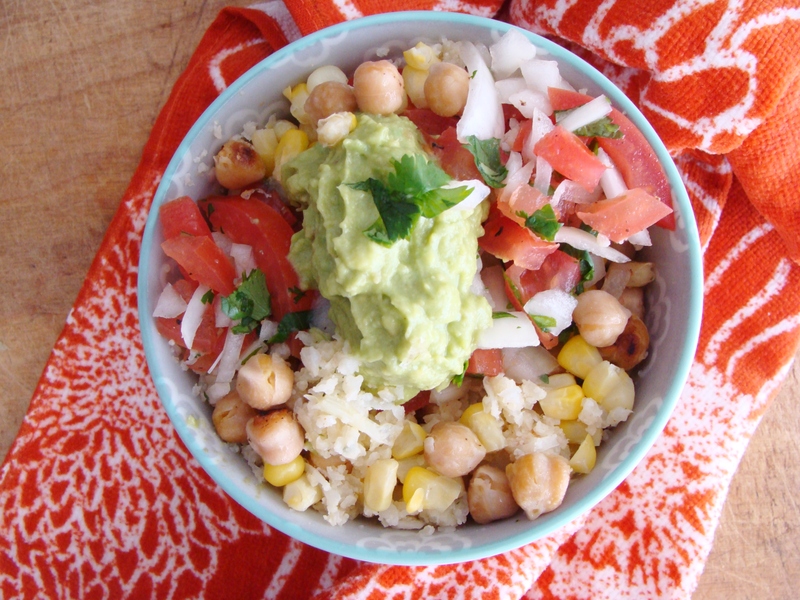 Put a heaping cup of cauliflower rice in your bowl. Add a spoonful of corn and a spoonful of garbanzo beans. Top with pico de gallo and guacamole! 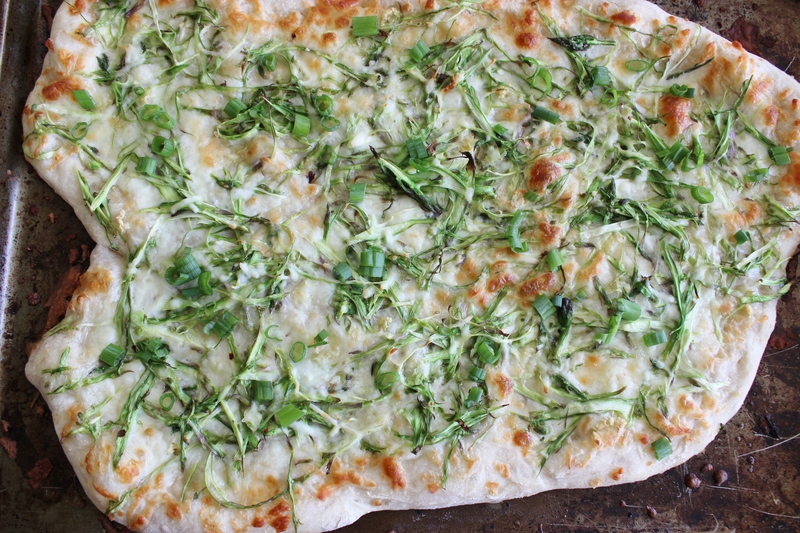 Now is also the time to add any other toppings you choose. This is really all up to you and what you like! I like a TON of guacamole. That’s just me. 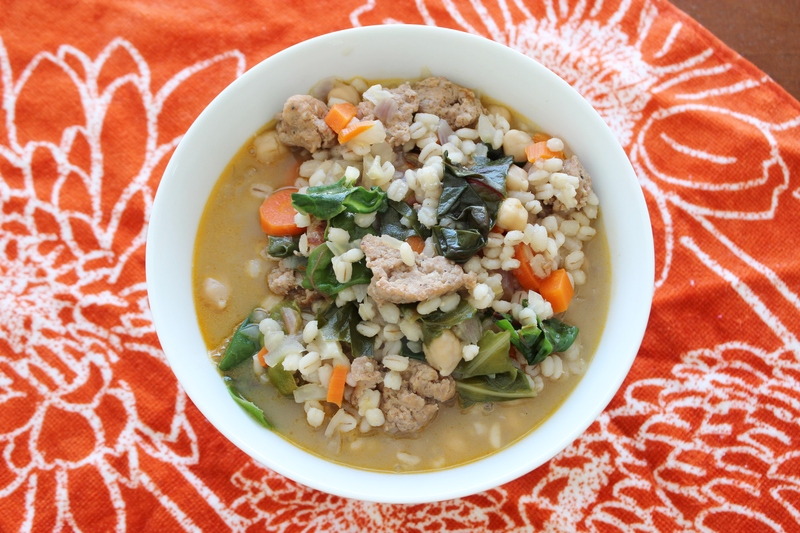 This is a fresh, healthy lunch or dinner! Mix it all up and dig in! Note: I would say that this recipe will serve two hungry people generously for a main dish, or is enough for 4 smaller lunch servings. If you wanted to opt for plain mashed avocado or avocado slices instead of guacamole, I think that would be fine. Turns out it tastes really, really good. Don’t be intimidated! This comes together quickly. Keep in mind that you could prepare the rice a day ahead of time. First: Cook the rice. Heat a medium pot over high heat. Add the rice, coconut milk, pineapple juice, and water. Stir well and bring the rice to a boil. Once it reaches a boil, reduce the heat. Simmer the rice for 30 minutes until it absorbs all the liquid. Then, set it aside to completely cool. 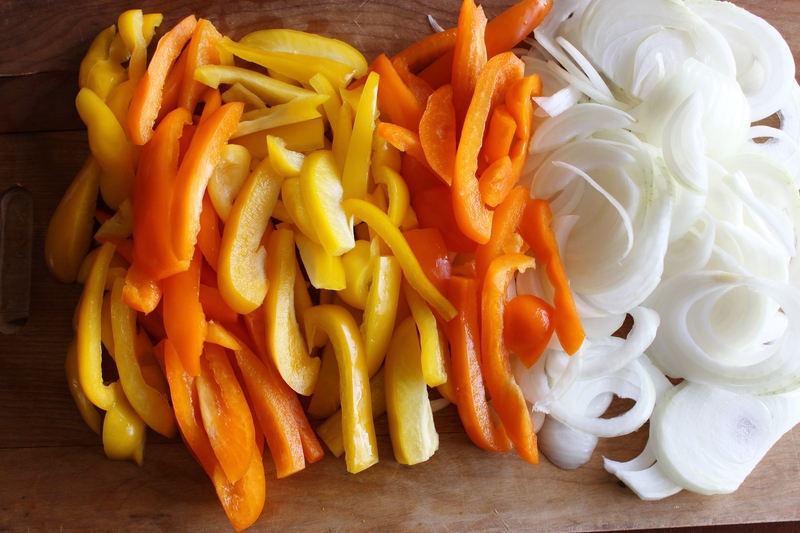 Next: Chop your veggies! Peel and chop your sweet onion. Mince your garlic and ginger. Cube your pineapple, if not already cubed. De-seed and chop your red pepper. 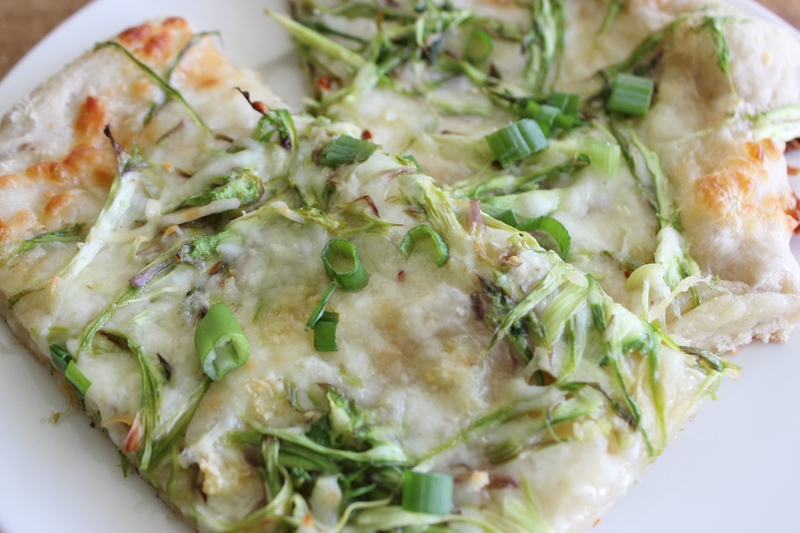 Thinly slice your green onions. Crack and beat two large eggs into a small bowl, and beat lightly with a fork. Have everything ready to go! 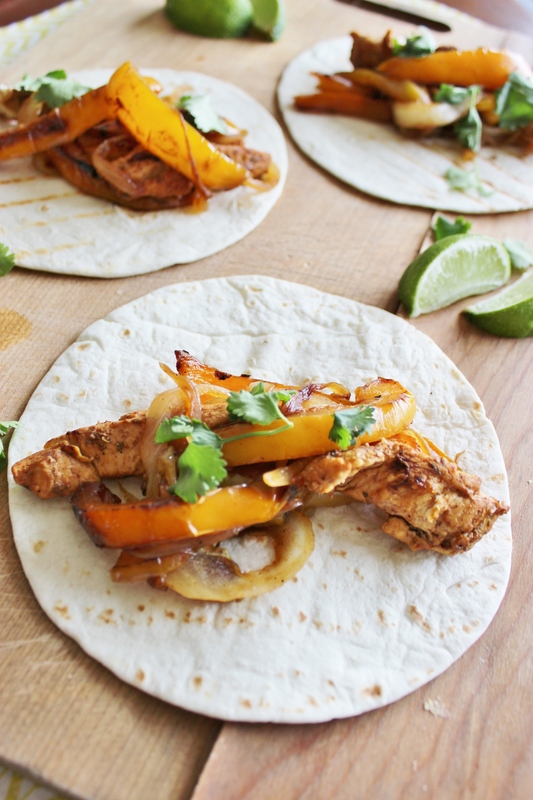 Heat a large skillet over high heat, and add one tablespoon of coconut oil. 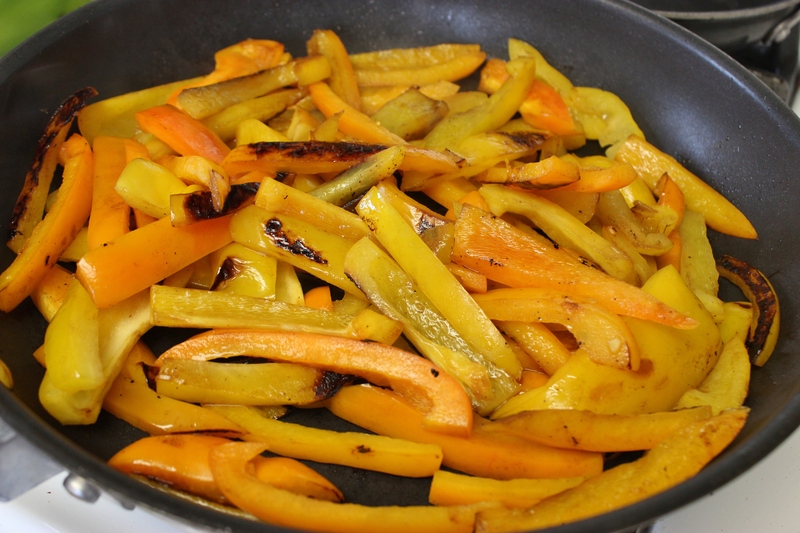 Allow the oil to melt, then add your chopped onions and red pepper. Stir for 2-3 minutes while the veggies cook. Then, add the garlic and ginger. Cook for no more than one minute (so the garlic and ginger doesn’t burn), then scoop the veggies out of the skillet and into a large bowl. Set the bowl aside. 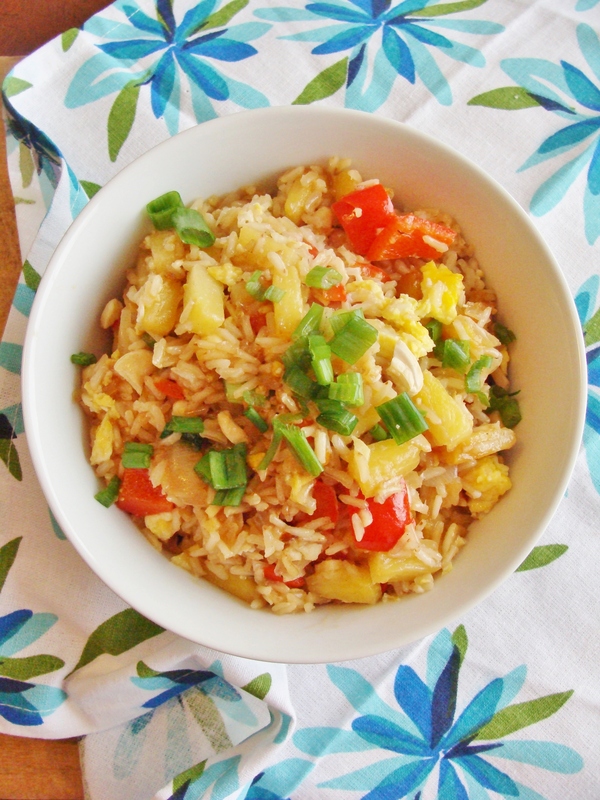 Add another tablespoon of coconut oil to your now-empty skillet, and add the pineapple. Stir and cook the pineapple for 5-6 minutes until it begins to brown. Then, add the sautéed pineapple to your bowl of veggies. Keep the bowl set aside. Add 1/2 tablespoon of coconut oil to your again-empty skillet, and pour in your beaten eggs. The skillet should be very hot by this point, so the eggs will cook quickly. Let them cook for 1 minute, stirring them the entire time so they don’t stick to the pan. Break the cooked egg up into small pieces. Then, return the cooked egg to the small bowl and set aside. Now, it’s time to put it all together! Keeping the heat high, add 2 and a half tablespoons of coconut oil to the skillet. Once it melts, add your cooked rice and toss to coat. Let the rice crisp and heat for 1-2 minutes, then reduce the heat to low. Add your soy sauce and stir well. 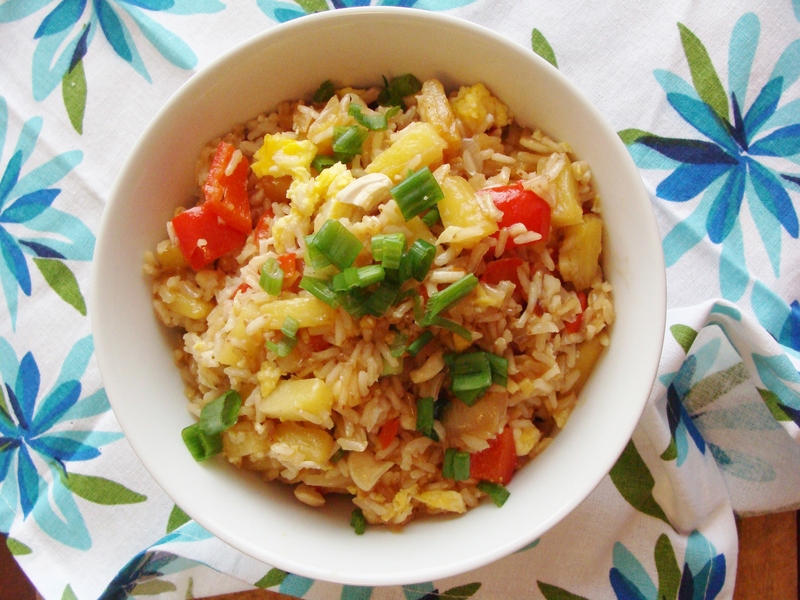 Then, add in your bowl of veggies and pineapple. Next, add your cooked eggs. Mix well. 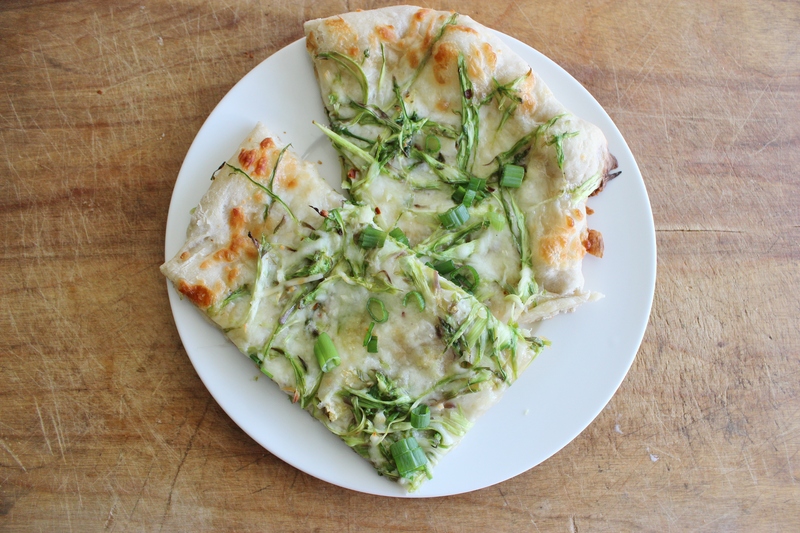 Top with the sliced green onions. If you want some extra crunch, sprinkle on some crushed cashews. If you’re so inclined, you could top the rice with grilled chicken or shrimp. If you have never cooked with coconut oil, or you’re wondering where to buy it, look for it next time you’re in Trader Joe’s. Also, one note: I used a bag of frozen pineapple tidbits rather than fresh pineapple. It worked fine, but I’d suggest using fresh pineapple for the best taste! 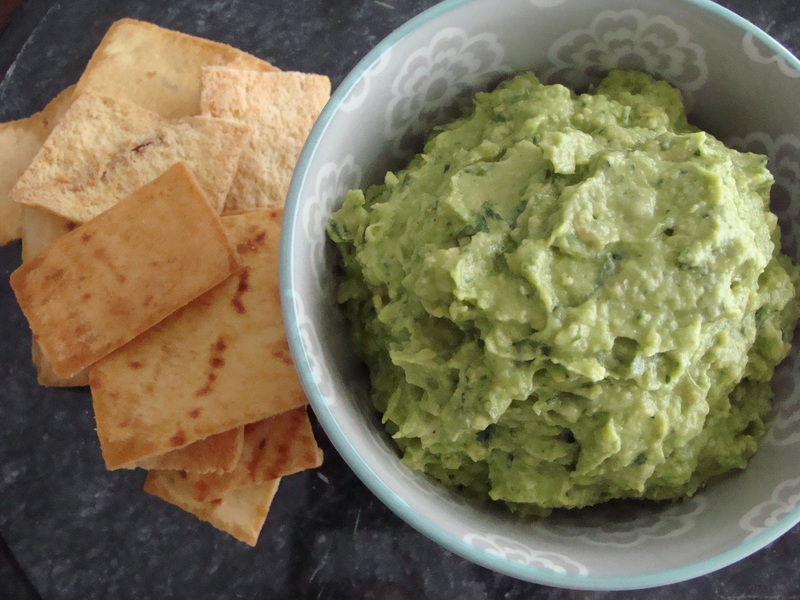 I have a simple dip to share with you today: guacamole hummus! 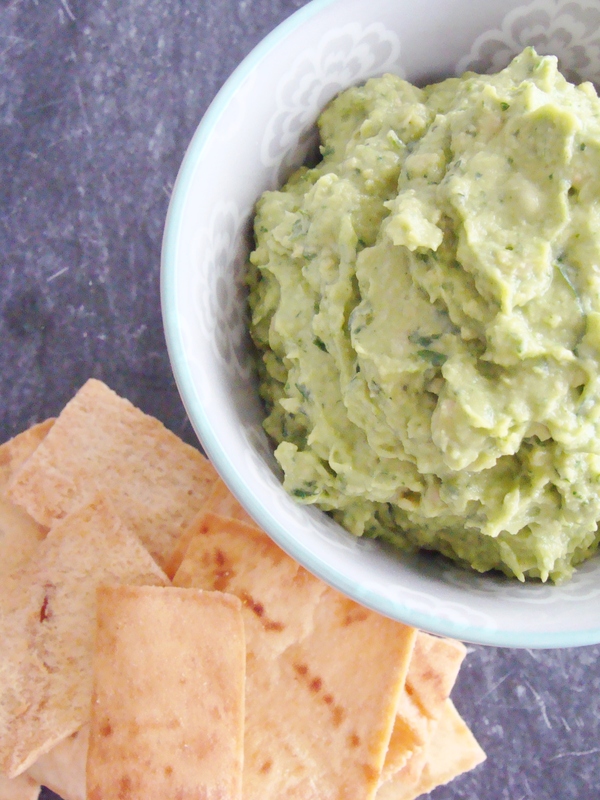 It is fresh, healthy, and pairs as well with veggies as it does pita chips or crackers. 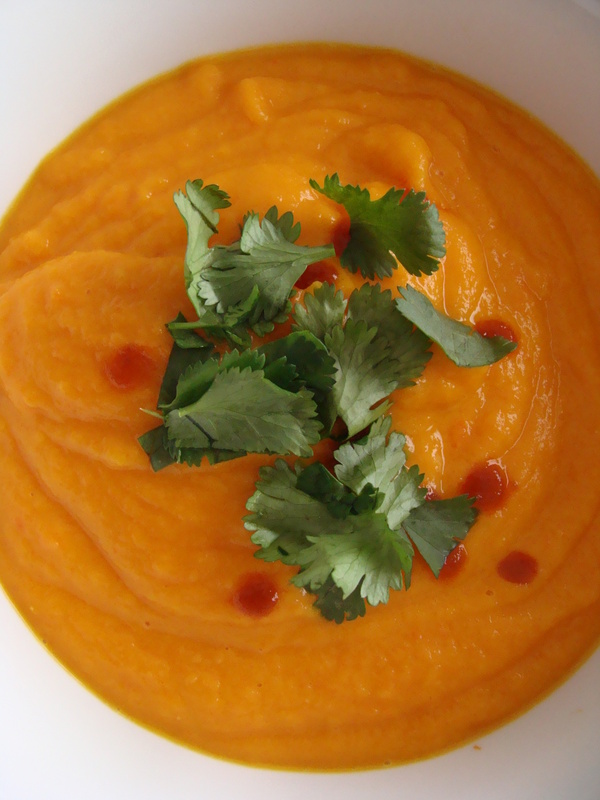 It also really takes just a few moments to prepare, so long as you have a food processor. I could (and do) eat this by the spoonful on its own. 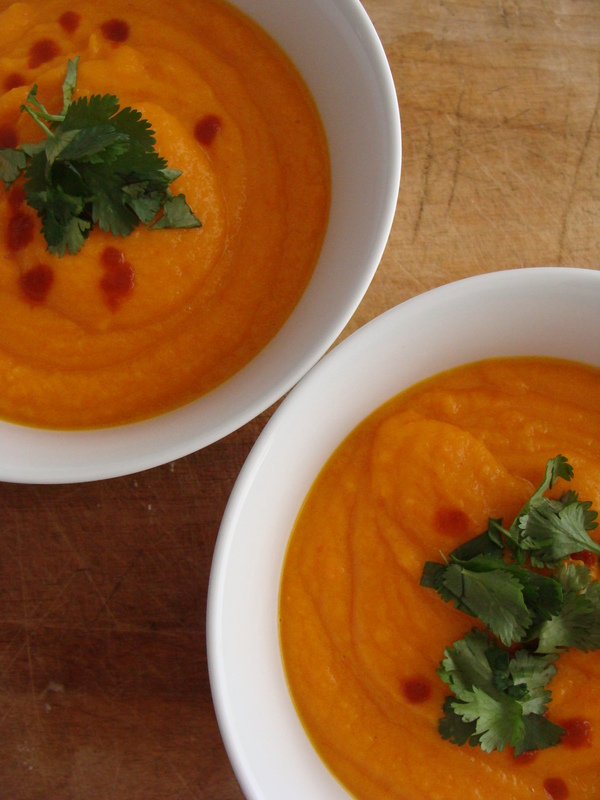 It’s tangy and savory–my favorite! 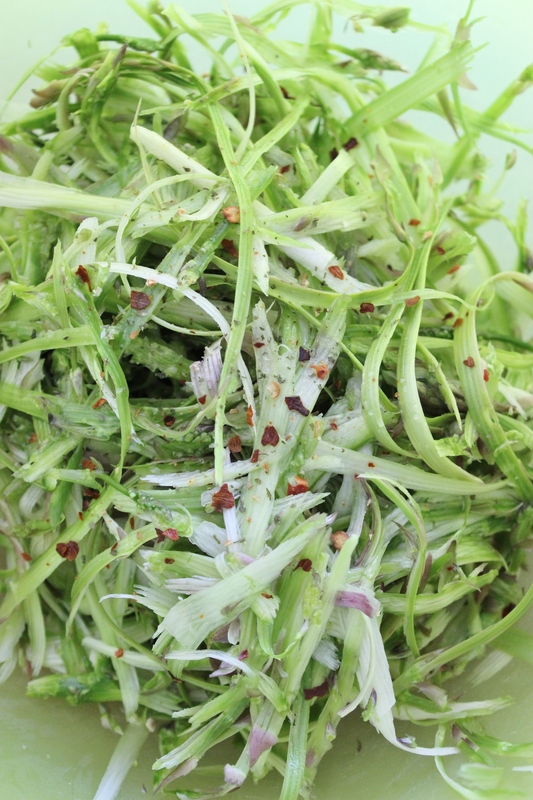 In a food processor, combine the cilantro leaves and garlic clove. 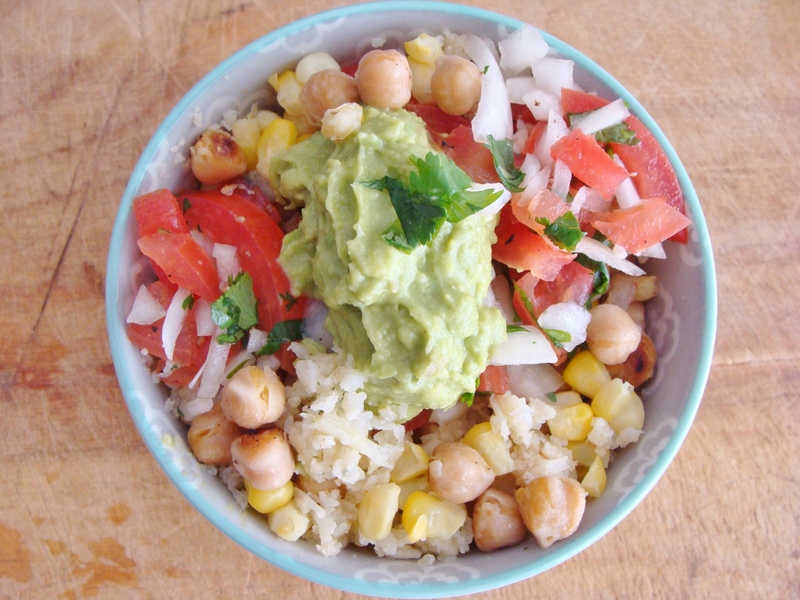 Process until finely chopped, then add the rinsed and drained chickpeas and chopped avocado. Keep processing! Drizzle in a stream of olive oil into the mixture as it processes, then add the lemon juice. Keep processing until smooth. Season with an additional squeeze of lemon juice and sprinkle with sea salt and black pepper to taste. 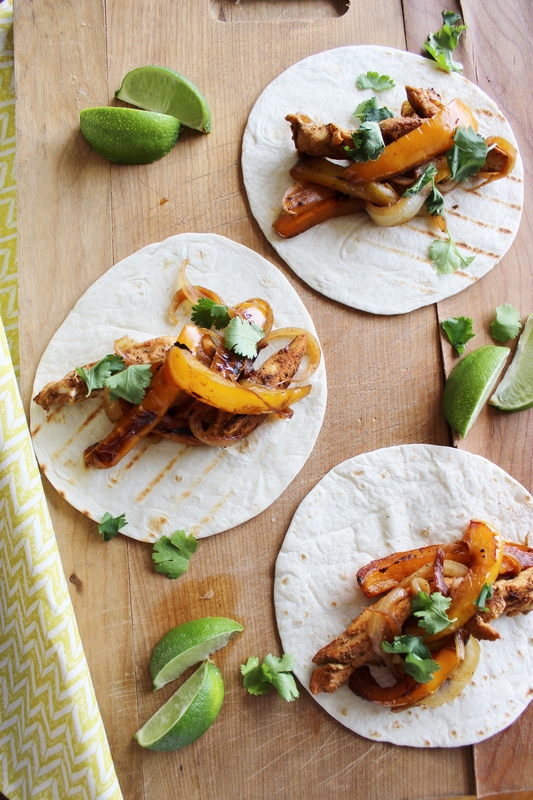 Garnish with additional cilantro, if you like. In my world, this makes about 2 servings—so if making for an appetizer for a party, you may want to double or triple this recipe. P.S. Thank you to Kate for the lovely new bowl! You are currently browsing the vegetables. category at The Cheesy Kitchen.